Emmanuel’s Project 2100 ministry is becoming a regional network of churches working together to recruit, equip, and support foster families. It will be called The Restore Network. The website looks amazing and will be public soon. The Alton Mission is one of the four primary churches involved right now, though we will visit several others this year to invite them to join us. 1. 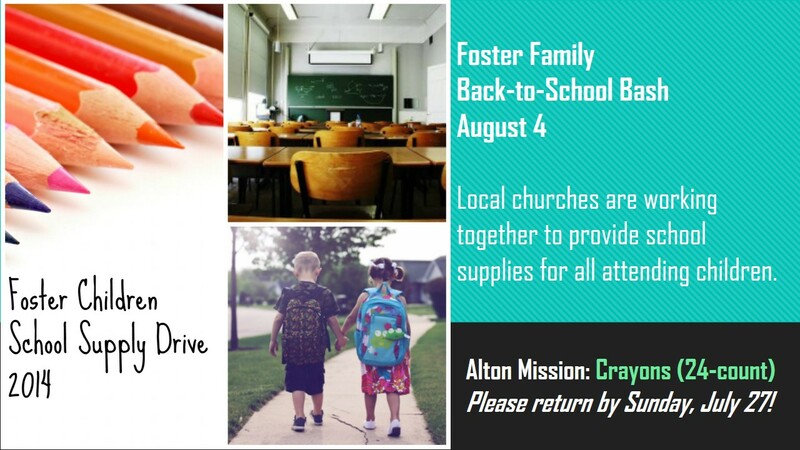 The Alton Mission is responsible for buying 130 boxes of 24-count Crayola crayons and 50 3-subject wide-ruled notebooks. The backpacks will be prepared this week at Emmanuel, so Katie has requested that we have our contribution there by Tuesday night (7/29). If you would like to go make these purchases for us, I can give you a copy of our sales tax exemption letter and then you’ll be reimbursed. 2. If you want to help prepare the backpacks, Katie will be working on Thursday morning (7/31) starting at 9am at Emmanuel. Email her, or let me know and I can text or email her. 3. If you want to help distribute backpacks, the pool party is next Monday evening (8/4) from 6:15 – 8:30pm. Again, contact Katie or let me know and I can contact her.